Two types of American Catholics? The American left and the church are irreconcilable, he writes. And as they make this discovery, “the children of liberal Catholics will either want their liberalism unvarnished by incense and holy water, or they will rebel and ask if there’s something more challenging, disobeying their parents by ‘reverting’ to Catholicism.” I expect a lot of America readers will question this theory, but I don’t have the theological background to rebut it on Deneen’s terms. Keep going, though, because after Deneen disposes of half the ideological spectrum in the United States, he describes an interesting schism among so-called conservative Catholics (whether or not that’s a redundant term). The task, then, is restore the basic principles of the American founding — limited government in which the social and moral mores largely arising from the familial and social sphere orient people toward well-ordered and moral lives. This position especially stresses a commitment to the pro-life position and a defense of marriage, and is generally accepting of a more laissez-faire economic position. 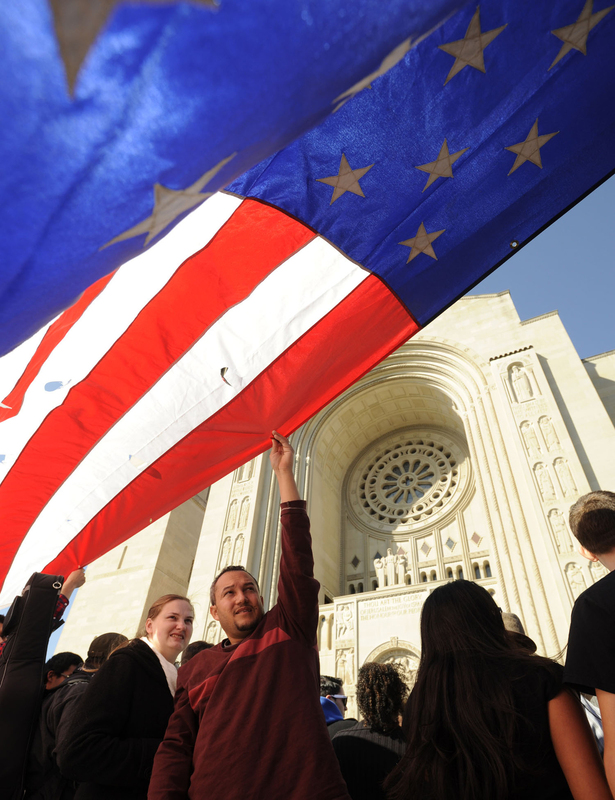 It supports a vigorous foreign policy and embraces a close alignment between Catholicism and Americanism. It has become closely aligned with the neoconservative wing of the Republican Party. The “radical” position — while similarly committed to the pro-life, pro-marriage teachings of the Church — is deeply critical of contemporary arrangements of market capitalism, is deeply suspicious of America’s imperial ambitions, and wary of the basic premises of liberal government. [...] Because America was founded as a liberal nation, “radical” Catholicism tends to view America as a deeply flawed project. […]It wavers between a defensive posture, encouraging the creation of small moral communities that exist apart from society — what Rod Dreher, following Alasdair MacIntyre, has dubbed “the Benedict Option” — and, occasionally, a more proactive posture that hopes for the conversion of the nation to a fundamentally different and truer philosophy and theology. I’m curious how much the second view overlaps with the libertarian view of smaller government (discussed again in yesterday’s post), though with the right to be left alone applied more to spiritual groups than to individuals. Do the “small moral communities” mentioned by Deneen resemble Orthodox Jewish neighborhoods and towns that enforce religious law to the extent they are able? Is the “radical” conservative Catholic position associated not simply with state sovereignty over the federal government, but with a separation from state and municipal laws that conflict with the “pro-life, pro-marriage” and other teachings of the church? I’d simply posit Catholicism as a necessary thorn in America’s side, a corrective counter-culture, an aspect of civil society that could actually help balance the more utilitarian and individualistic forces that dominate liberal polities, and can make us all more miserable and less fulfilled as human beings. Catholicism therefore greets American capitalism not with socialism, or with any rival socio-political order, but with the simple Gospel insistence that money does not lead to happiness and in fact is one of the greatest impediments to it. *Apologies to all who have already seen this on Sullivan’s popular blog, but I know a lot of Catholics and non-Catholics who can’t stand anything he writes. Given the range of views and topics on his blog, this irritation is not very small-c catholic. "I’m curious how much the second view overlaps with the libertarian view of smaller government" I would urge spending more time reading The American Conservative rather than Reason. Given the range of contributors there, and their various interests, it's difficult to suggest they all share the same views (I suspect, for instance, that Daniel Larison may not share Rod Dreher's views with respect to social conservatism). But in no way can they be characterized as "libertarian" - most particularly since they have all savaged the present day economy. For example, I doubt you'd find this piece on Reason: http://www.theamericanconservative.com/eric-cantor-picks-the-right-40-yard-lines/. No doubt they think the size, etc. of the federal government is too large, but that, in itself, is not particularly "libertarian." As the piece linked to above notes, there is an emerging group of policy-wonks developing an agenda focused on under-employment, etc. that bifurcates the staid debates of libertarianism & unchecked state power. This agenda may include some libertarian voices, but it also includes figures on the right who are far from libertarian, such as Ross Douthat & David Brooks. This debate is interesting (and liberals/progressives should welcome it), but too often it seems to be dismissed outright as "libertarian." I think the point of being part of a Christian church is to connect to God as Jesus. It's odd to me that a Notre Dame professor is saying that people will choose to go to church based on how much they agree or disagree with the political and economic views of their fellow parishioners. Are they worshipping something different at Notre Dame these days? Patrick Deneen should be allowed to speak for himself rather than being filtered through a lesser light like Andrew Sullivan. America was very bold to publish Michael Baxter's brilliant takedown of John Courtney Murray. Voices like Baxter's and Deneen's (and William T. Cavanaugh's, whom Deneen puts in his camp) should not be shunted aside as "conservative," much less branded "libertarian." They represent Catholic social teaching at its best.